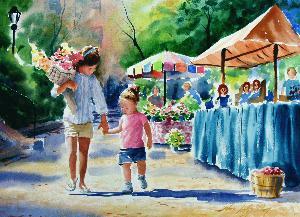 John Fitzgibbon has conducted watercolor workshops nationally and internationally. While in Ireland John painted a series of forty watercolors of the people and places of that beautiful country. John works in all mediums but watercolors are his favorite. He says that watercolors have a fresh spontaneous quality that is almost impossible to achieve in other mediums. A stunning example of his watercolors is seen here in this painting entitled "GUARDIAN ANGEL". John and his wife, Debbie, reside in Springfield, Mo. Here John maintains his studio where he manages his time between workshops, commissions and art shows.